The chart above shows how users’ ability to remember material changes over the six weeks since they last saw it. 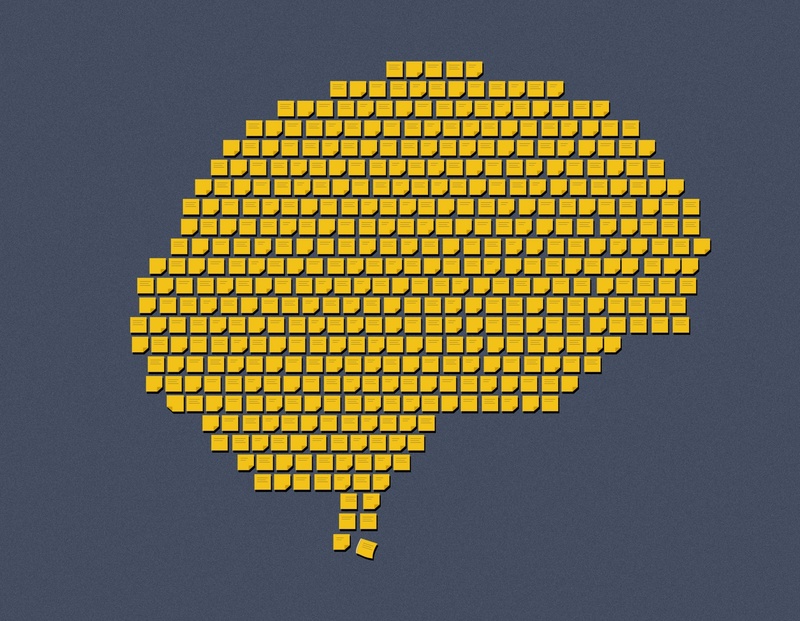 Naturally, the longer since you last saw something, the harder it is to remember it - but the number of times you reviewed the material before that has a big impact on whether it fades quickly from memory, or stabilizes. Each line shows the average change in accuracy after a certain number of reviews on Cerego. 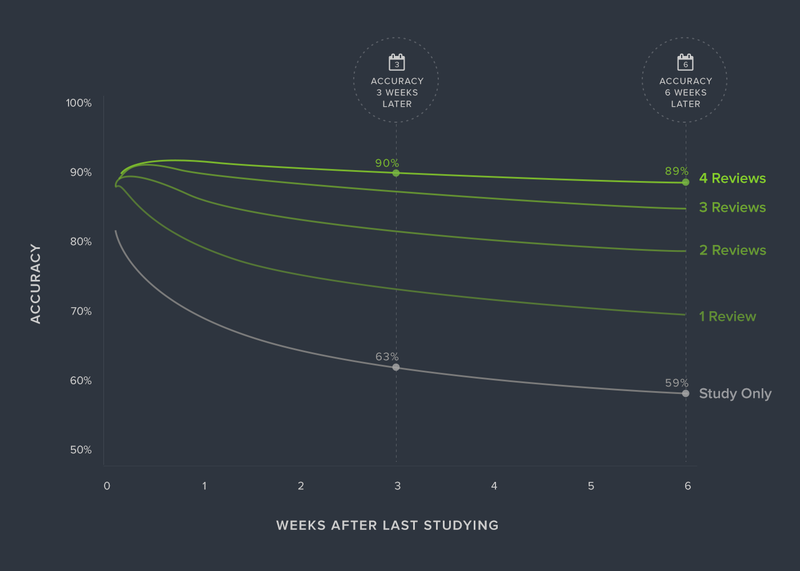 The gray line, for example, shows that after studying the material for the first time, the ability to remember it quickly drops from around 80% in the first couple of days to 63% three weeks later, and to below 60% after six weeks - simply studying something new doesn’t mean it sticks. On the other hand, coming back to something you’ve learned and trying to retrieve it is the best way to build lasting memory for it: an important principle in cognitive science known as the testing effect. It’s important to remember that the review doesn’t have to be accurate - even if you get it wrong, making an effort to recall something and being reminded of the right answer afterwards is a valuable learning experience that boosts your retention for the material almost as much as the reviews you manage to recall correctly. This is clear from the data above. Just completing a single review on Cerego (about 30 seconds per item, a few hours after first studying it) has a big effect on long-term retention for that material - even if you get it wrong! An immediate 5% improvement in the first day or two grows to a 10% difference a few weeks later, as the memory for that material is more robust, and fades much more slowly. And completing 4 reviews (something that usually takes around 2 minutes per item over 3-5 days) builds a stable mastery of the material that gives 90% accuracy even weeks later. Why is this important? 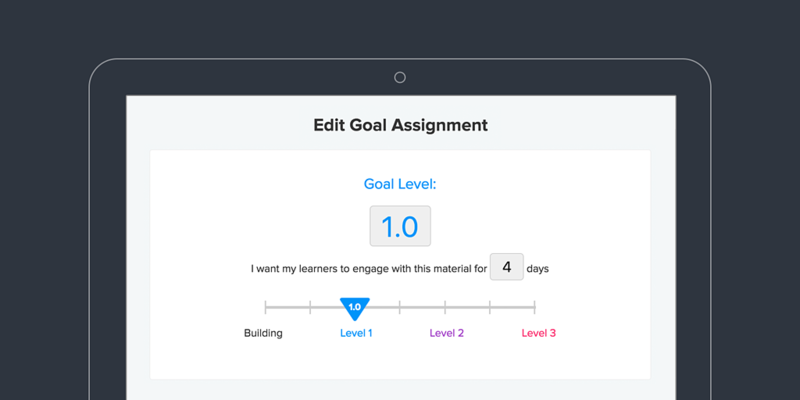 Well, in Cerego an instructor can set a retention goal for learners to achieve. The simplest goal that Cerego recommends is to reach Level 1 retention: this takes around 3-4 reviews in Cerego to reach, equating to around 2 minutes of work split over about 4 days. As we’ve seen, those 3-4 reviews aren’t just busywork - they get a learner from 60% to 90% accuracy six weeks later! The evidence is clear: following your schedule in Cerego, even just for the first few days, builds mastery for material that sticks around for weeks and months afterwards.